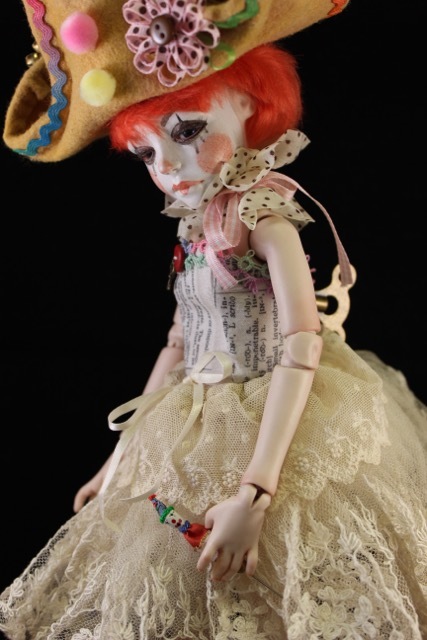 We were very excited to introduce Kori's beautiful BJD original artist dolls at our 29th Annual doll show last October. 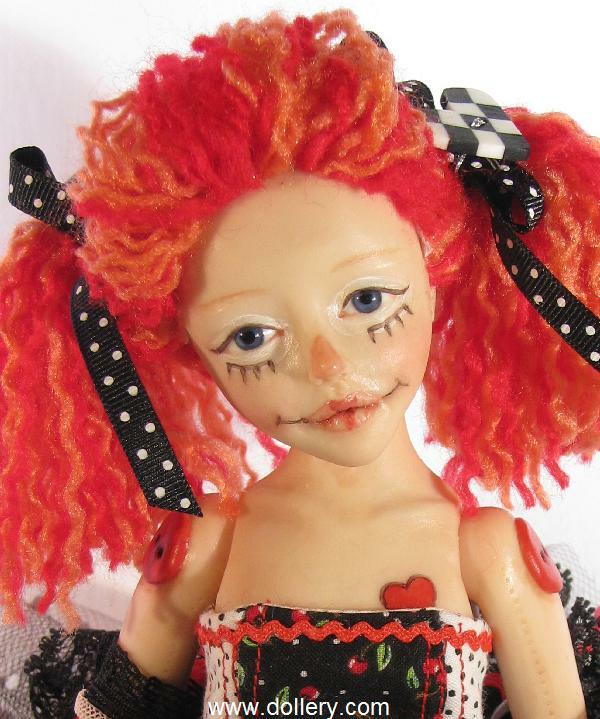 Her "Raggedy" Ann themed doll below is just incredible for the money. It is fully articulated in polymer clay! The eyes and wig are not removable. 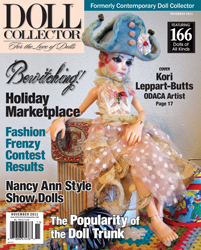 Kori is featured in a write up in our most doll show catalogue - you can go to page 74 and 75 in our most recent show catalogue -http://www.dollery.com/html/DollShow2011/DOLLSHOWCATALOGUE2011.pdf on our last catalogue for a full bio on her or go to the recent October Doll collector for more info as she graced the cover of it! Kori is currently working on a sleeping "Snow White" and we are excited to see how she will turn out. 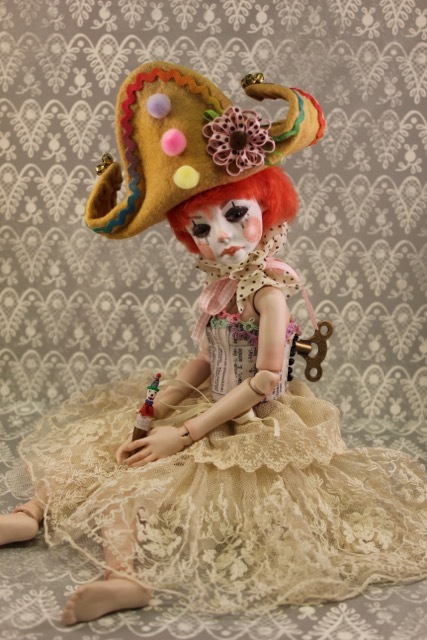 She also takes custom orders for "Alice in Wonderlands" or any other theme you are looking for so be sure to contact kmalone@dollery.com for details. 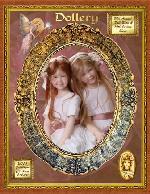 Limited edition of 5 Ball Jointed Doll - The doll is available in Alabaster as shown here painted in China paints. 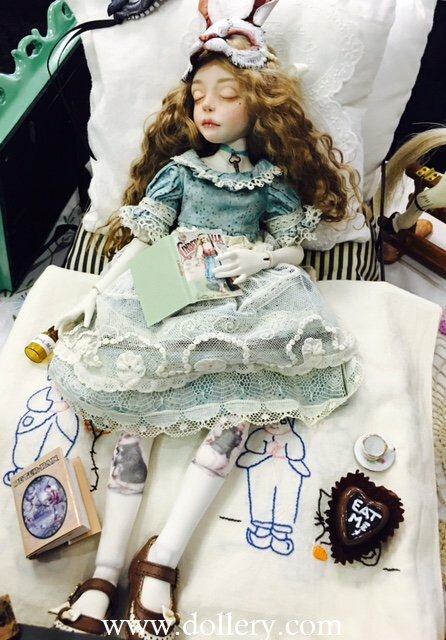 The doll is dressed as shown and includes "Drink Me" bottle, and choice of cat or rabbit mask. The masks are sculpted of leather! This doll is limited to five world wide and only one is left available. 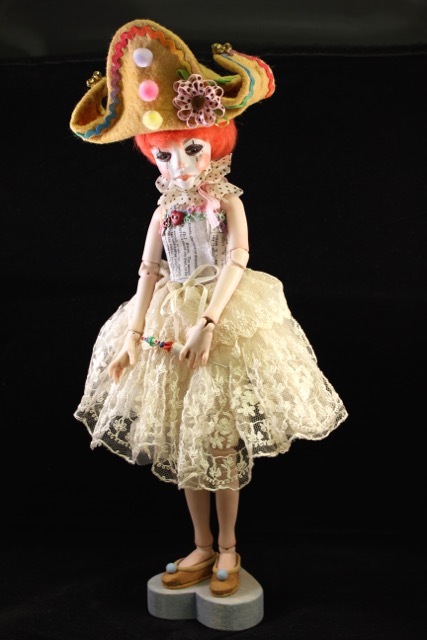 One of a Kind Ball Jointed Doll. 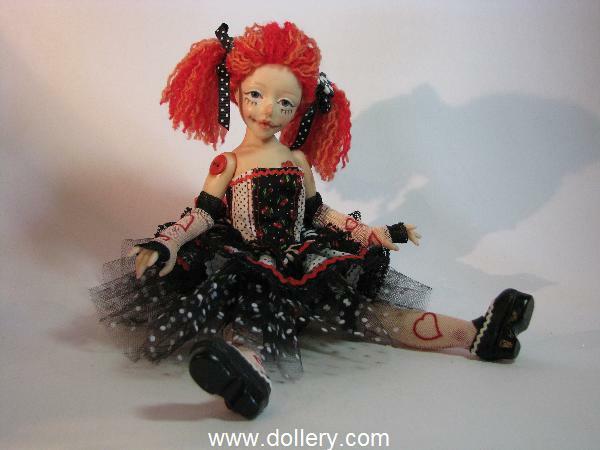 Rag Doll, $1,100.00 Hand made entirely by the artist herself! "Wow" - the stand, box...everything - so amazingly artist. 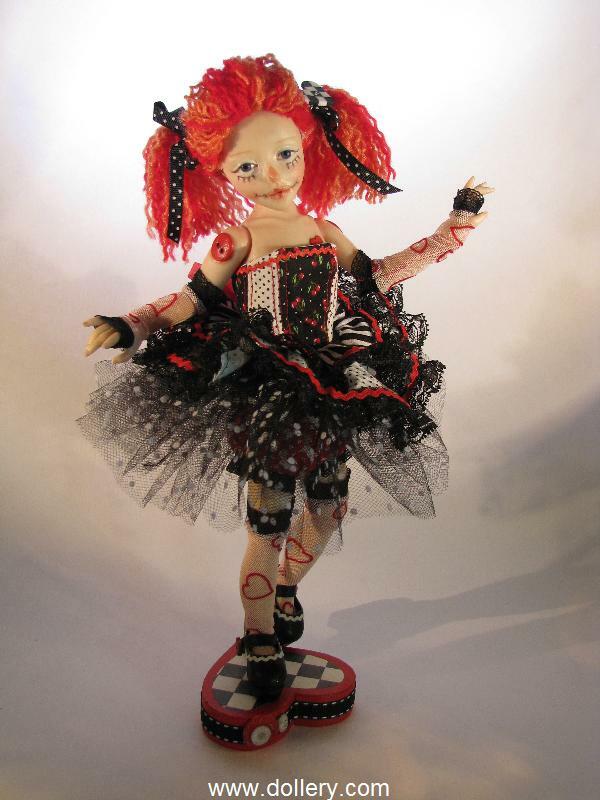 SOLD - inquire on others coming including custom OOAK "Alice in Wonderland" BJD dolls! Polymer Clay, BJD, Paperweight Glass Eyes, Yarn Wig, 11" - eyes do not come out/wig does not come off. This artist is new to the Dollery this year. 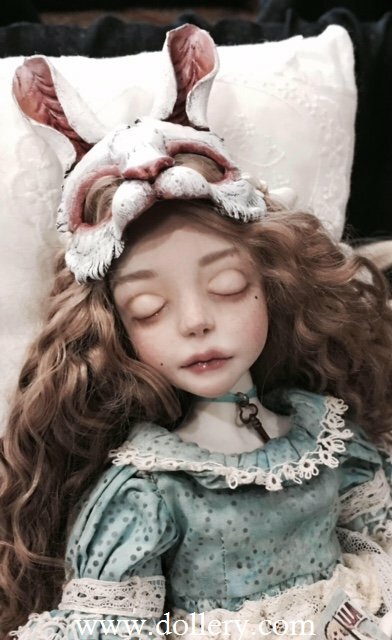 We continue to be intrigued with the BJD market but are looking primarily for one-of-a-kind or very small edition artist doll versions of BJD dolls. These dolls do not have removable eyes or wigs. Kori’s dolls are intriguing as there seems to be quite alot of detail that goes into everything from the doll itself to the packaging and the hand made stands. 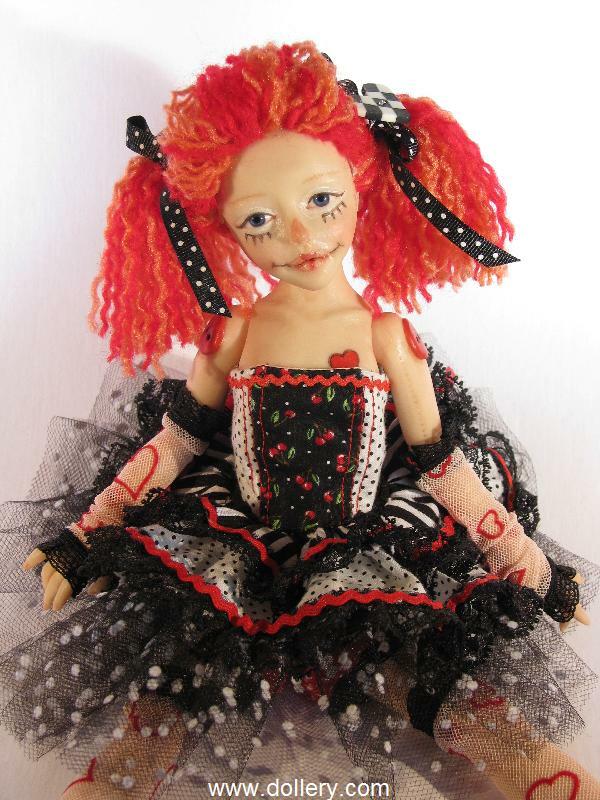 The name of this doll is “Rag Doll” and she is 11 inches high and made of polymer clay not resin or porcelain! All of her accessories were hand made by Kori. She has 14 points of articulation. 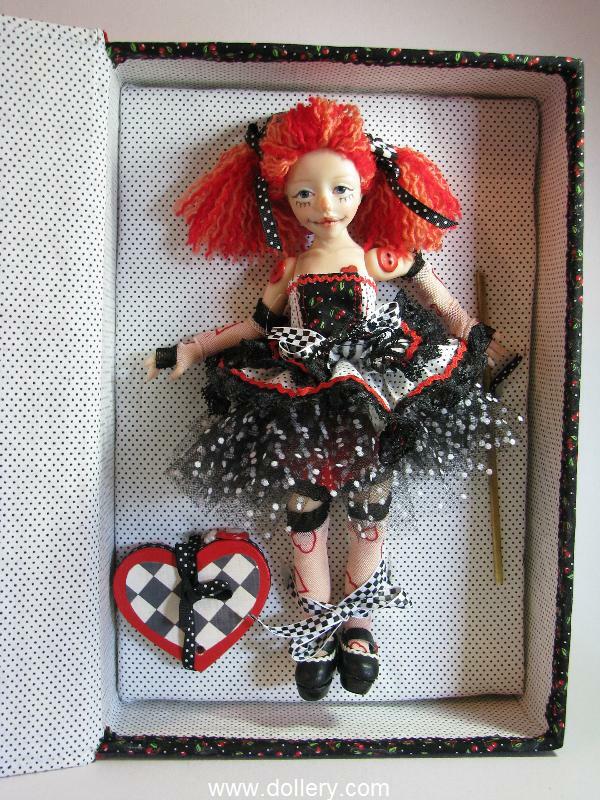 Kori does a wide variety of dolls in different mediums. 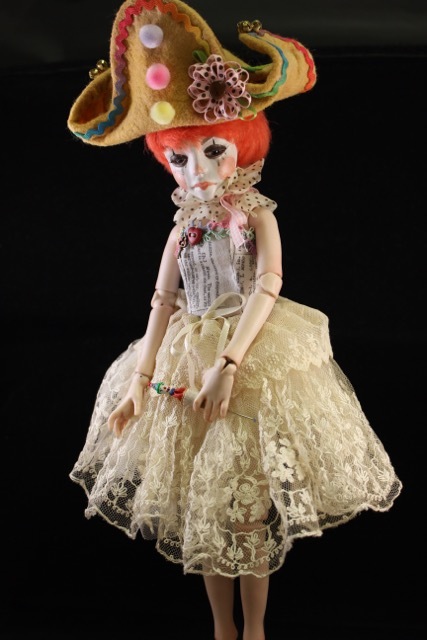 Click here to view a video about this doll! *Note- correction the doll has glass eyes not painted eyes as mentioned in the video!